The painters finished yesterday. I closed the door and looked around at a freshly painted blank slate. Now the fun begins. I want to decorate slowly, to allow myself time to find pieces that I really like. Many of my furniture pieces did not come with me because they were too big for this space. 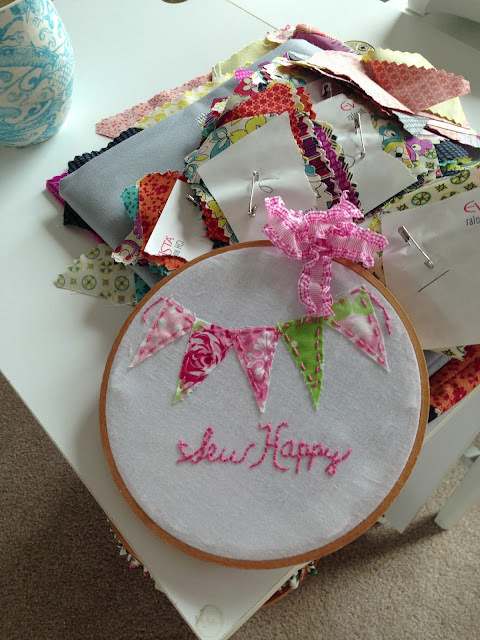 I spent some time in my sewing room over the weekend. The walls are PINK! It's a beautiful color named "Possibly Pink" by Sherwin Williams. I love it, it's soft and pretty. 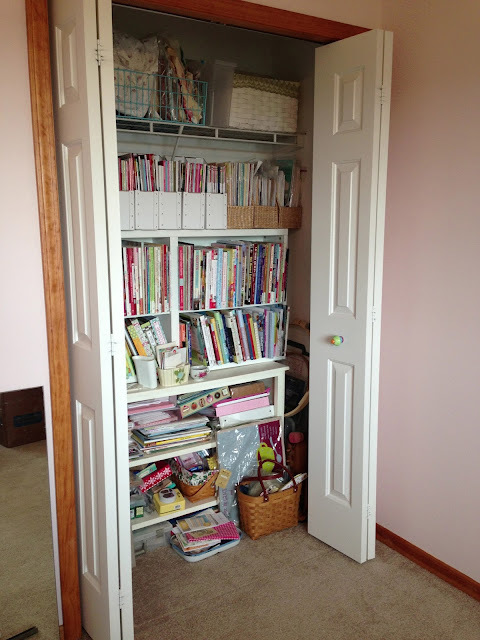 One of my biggest challenges with this room is book storage. I parted with a big cupboard before the move which housed my books so I've decided to use the closet. As you can see, I still need to purge and organize, but the books are out of the boxes which was the goal. 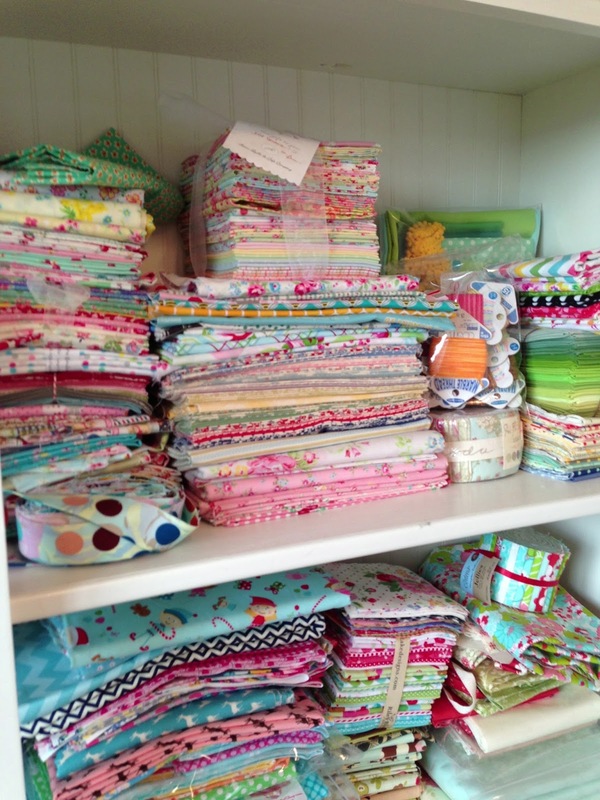 Putting my fabric in the cupboard was like taking a walk through a lovely garden. I was back in my happy place. The view from my window overlooks the neighbors backyard and I can still see the pretty barn. Lots of birds, bunnies and even the occasional coyote pass through that field so I plopped my sewing machine right in front of the window as to not miss any of it. I'll have better pictures when I get more done. Have a wonderful day! 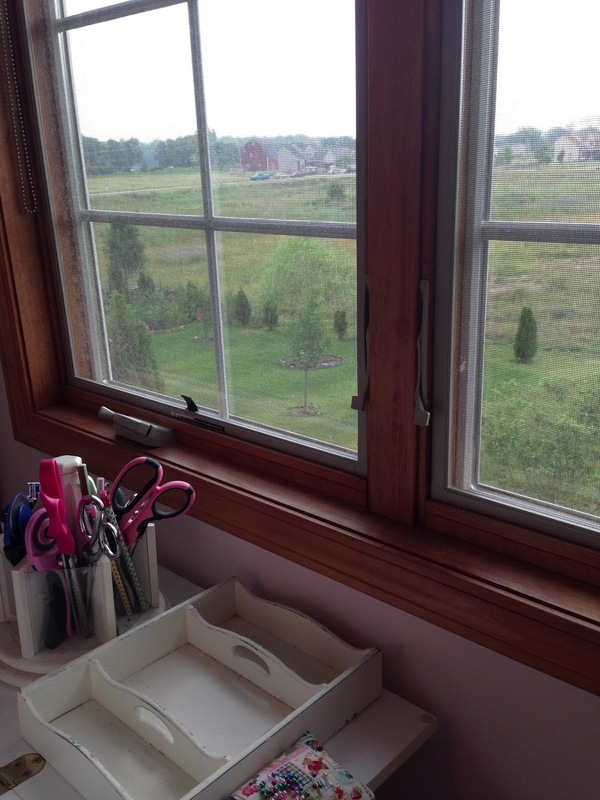 Your sewing room is going to so cute and what a great view!! Have fun!! Love the color and what a nice view! We live on 10 wooded acres and have a beautiful view out of all the windows upstairs. 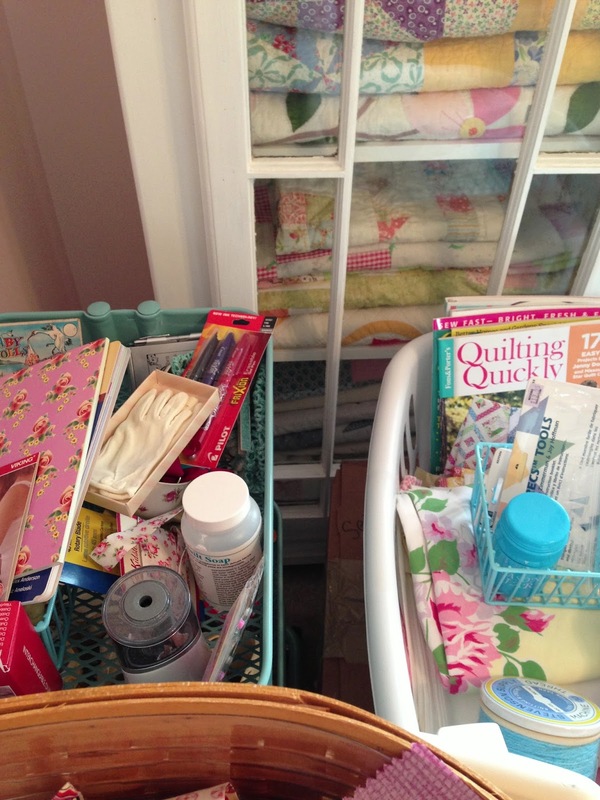 We live in a walk out but my sewing room is downstairs in an area without any windows. We have 7 grands and needed to keep one room upstairs with twin beds for them when they visit and the other bedroom upstairs is my hubs office because he works from home. One day when the grands all grow up and don't come for to visit so much I may make a change but I am envious of your window with a view. Such a lovely happy place! And that view....my! 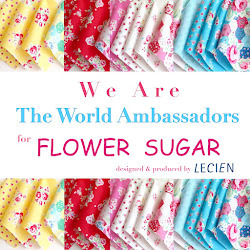 Pretty pink indeed and love seeing all your pretty fabrics! I have my craft table in front of my window. It faces the backyard. No animals to see, just the tops of the trees! Peaceful all the same. Your pink looks really pretty. I can not wait to see more of it. Don't you just love going through your fabrics?